Be Spoke Bodies: This multi-media exhibit in the Prudential Center explores the intersection of healthcare, style, and technology in prosthetic design. Free, 10 a.m.-9 p.m., 101 Huntington Ave., Boston, facebook.com. Hospitality Industry Night at Republic Fitness: This class is exclusively reserved for those who work late nights in the hospitality industry, whether or not you are a member of Republic Fitness. The workout will include a high intensity boot camp followed by drinks and apps at Tiki Rock. Free, 6:15 p.m., Republic Fitness, Two International Place, Boston, eventbrite.com. Monday Motivation Panel: This panel workshop, with speakers like Kelly Brabants and Gordie Gronkowski, will cover how to tap into your own motivation to achieve success. $10, 6:30 p.m.-8:30 p.m., The Revolution Hotel, 40 Berkeley St., Boston, facebook.com. Joggers Club with Candice Peak: Squeeze in an after-work jog with Outdoor Voices ambassador Candice Peak for a fun run around Seaport and Fort Point. She’ll also lead you through some bodyweight exercises too. Free, 6:15 p.m.-7 p.m., OV Boston, 31 Northern Ave., Boston, events.outdoorvoices.com. MSL Pilates Spring Reset: Release tension and challenge your core in this functional movement-focused Pilates class. $5, 6:30 p.m., The Revolution Hotel, 40 Berkeley St., Boston, eventbrite.com. Life Time Athletic Free Group Training: During this one-night event you’ll be able to try out all four of Life Time’s group training formats including GTX burn, GTX cut, Alpha Metcon, and Alpha strong. An after-party social will follow the workouts. Free, 5:30 p.m.-8 p.m., all Life Time Athletic locations, lifetime.life. Gains of Thrones: This donation-based boot camp class is completely Game of Thrones themed where you’ll be able to win prizes, chat all things GOT, and enjoy post-workout snacks. Proceeds from the class go to benefit the Oak Square YMCA’s youth development programs. $15, 7:30 p.m.-8:30 p.m., Oak Square YMCA, 615 Washington St., Brighton, facebook.com. Donut Run: The Boston Road Runners are hosting a fun run followed by fresh donuts to benefit the Community and Youth Initiative. Choose from three, five, or seven miles. Free, 6 p.m.-8 p.m., Under Armour Brand House, 800 Boylston St., facebook.com. Daybreaker Bos: This month’s yoga and early-morning dance party will honor Earth Day, so wear an animal-inspired costume and come ready to party. Free kombucha and breakfast bites will be provided afterwards. $22, 6 a.m.-9 a.m., Paradise Rock Club, 967-969 Commonwealth Ave., Boston, daybreaker.com. Black Women’s Health Workshop: Discuss your reproductive health and how the intersection of racism and sexism affects health outcomes for black women. A panel of speakers will provide their knowledge so you can take your health into your own hands. Free, 7 p.m., Reggie Lewis Track and Athletic Center, 1350 Tremont St., Roxbury Crossing, eventbrite.com. Yoga Series with Anne Patrick: The second part in this three-part yoga series with Anne Patrick will focus on your neck, shoulders, and back. Free, 6 p.m., New Balance Global Flagship at Boston Landing, 140 Guest St., Boston, eventbrite.com. Wim Hof Intro Series with Samuel Whiting: Learn how to control your breathing and your mind in extreme situations from Wim Hof instructor Samuel Whiting. $48, 6:30 p.m.-9 p.m., BKBX, 211 Western Ave., Boston, eventbrite.com. Steel Mace Flow Certification: Learn how to safely and effectively incorporate steel mace training into your workouts, or your clients workouts. You’ll learn how to apply this training method to a structured program and how it can be beneficial to any skill level. $599, April 27 and 28, 12 p.m.-6 p.m, Rx Strength Training, 50 Tufts St., Somerville, steelmaceflow.com. Crystal Energy Yoga Class: During this yoga class you will dive into crystal energy and how practicing with crystals can help your yoga, meditation, and mindfulness. Free, 9 a.m.-10:15 a.m., CorePower Yoga, 1282 Boylston St., Boston, facebook.com. Bumble x Back Bay Boxing: Treat yourself to an intense (and free) boxing class to kick start your weekend at Back Bay boxing. Bumble will be handing out free water bottles and fun treats. Free, 1 p.m.-2 p.m., 350A Newbury St., Boston, facebook.com. Reproductive Equity: Bring your questions to this 30-minute discussion about reproductive equity in the United States led by the founder and executive director of the Resilient Sisterhood Project Lilly Marcelin. Free, 12 p.m.-1:30 p.m., Beacon Gallery, 524 Harrison Ave., Boston, facebook.com. Teddy Bear Clinic: Bring your kiddo and their teddy bear to this clinic with activities designed to highlight the body, physical fitness, nutrition, and healthy habits. Free, 10 a.m.-1 p.m., 1135 Dorchester Ave., Boston, eventbrite.com. Live Podcast and Mental Health Forum: Listen in on this live filming of Celeste Viciere’s podcast with State Representative Liz Miranda. They will cover mental health and Class Act Catering will provide lunch. $10, 12:30 p.m., 550 Dudley St., Boston, eventbrite.com. K n B’s Remix: Enjoy a massage before a yoga flow and dancing during a day party at this special event hosted by My Sisters Back. $15, 3 p.m.-9 p.m., The Ghost Walks, 57 Stuart St., Boston, facebook.com. Sam Adams Brewery Fun Run: Enjoy a fun run through Jamaica Plain before heading to the Sam Adams Brewery for free brewery tours and a pint of beer. Free, 10 a.m., Samuel Adams, 30 Germania St., Boston, eventbrite.com. 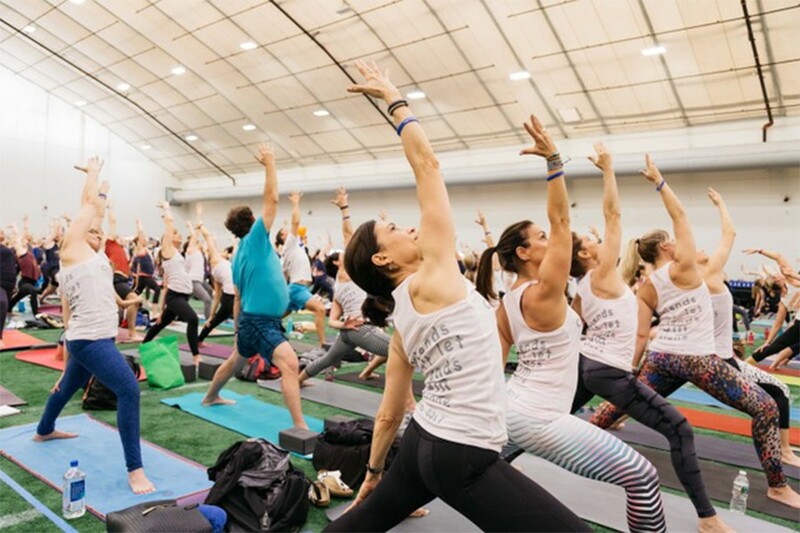 Yoga Reaches Out: Head to your mat with hundreds of other people at Gillette Stadium for a yoga event to raise money for Boston Children’s Hospital. $25, 9 a.m.-4:30 p.m., Gillette Stadium Fieldhouse, 1 Patriot Place, Foxborough, secure.childrenshospital.org. Walk for HAWC: Raise money for survivors of domestic violence during this 5k walk in Salem. $26, 10:30 a.m., Salem Common, N Washington Square, Salem, secure.qgiv.com. Spring Reboot: This two-part workshop consists of a two hour yoga class focusing on the core and dynamic poses, followed by a hand crafting portion. You’ll make an organic body scrub and an organic aromatherapy body oil to take home. $55, 11:30 a.m.-2 p.m., Asana Charelstown, 20 City Square, Charelstown, asanacharlestown.com. 37th Annual Run of the Charles Canoe and Kayak Race: Whether you’re racing or spectating, come out to the Charles for river games, live music, a taco truck, and a Sam Adams beer garden. $65+/racers, free for spectators, 8 a.m.-5 p.m., Artesani Park, 1255 Soldiers Field Rd., Boston, facebook.com. Handstand Workshop: During this workshop you’ll work on gaining the strength and flexibility needed to flip upside down, while also focusing on alignment and balance. Please bring thick socks. $45, 12 p.m.-4 p.m., AcroStrong, 6 Spice St., #11, Charlestown, facebook.com. Brunch, Balanced with Beyond Strong: Every Sunday, during the spring and summer, you can head to Casa Cana for a workout class by Kick It By Eliza, cocktail from Keel Vodka, and brunch on the patio. $25, 11 a.m.-12 p.m., Casa Cana, 1234 Soldiers Field Rd., Boston, facebook.com. Arm Balance and Inversion 101: This anatomy-focused session will guide you through how to balance upside down beginning with a vinyasa flow. $25, 1:30 p.m.-2:30 p.m., Starr Yoga Roslindale, 339 Belgrade Ave., Roslindale, facebook.com. Yoga Strong: This free yoga class benefits the Julie Fund, so a $10 donation is suggested. All levels are welcome. Please bring your mat and water. $10, 9 a.m., Nike Boston, 200 Newbury St., Boston, eventbrite.com. Sunday Bunzday: Head to Turtle Swamp Bier Hall at the Roslindale Substation for a 50-minute dance and high intensity work out, followed up by a free full size pour of your choice. $20, 11 a.m.-12 p.m., Turtle Swamp Beer Hall Roslindale Substation, 4228 Washington St., Boston, eventbrite.com.